Mahogany top, rosewood back, walnut peghead, cherry sides, purpleheart bridge, sawdust-and-glue fret markers, bone and pen shell inlay. The peghead is hollow to hold picks and capos. The words on the pegbox and the fret markers are in letters and numbers from the Adamic writing system, my own alphanumeric character set. My number system is base twelve, because it's divisible by two, three, four and six. In base twelve, one-third is not an infinitely repeating decimal, it's a very short dodecimal: ".4" Coincidentally, there are twelve frets per octave. Thus, the "10" at the twelfth fret is equal to 12 in base ten. The word between frets and bridge is the dulcimer's name in Fëanorian script. The original fretboard was replaced by this one raised off the body — the first of these — which along with the pressure type bridge doubled the volume. The tuning machines were harvested from my first guitar, a blue electric Kay. Though I wrote some songs on the guitar, I never warmed to it as an instrument, but my brother Moondi plays the living dren out of them. 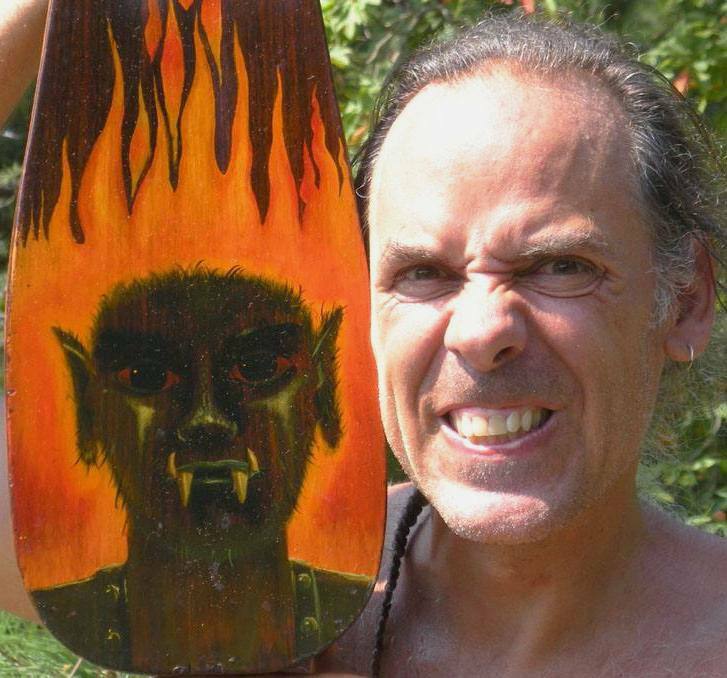 On the back of this dulcimer is a portrait of an Orc. Scroll down for a photo of it. On the case is an ink-over-oil reproduction of a photo I took of a sunrise from our house in Setauket, NY. Color by Windrow, ink by me. And the stickers? All folk musicians put stickers on their axe cases. I just respelled some. A portrait, by my mom Patricia Windrow, of my idea of an Orc, specifically Grishnakh of Mordor (who had Merry and Pippin for a while — don't remember him from the movie? Read the BOOK.). I thought of it because the color of the rosewood reminded me of what I imagined an Orc's skin color to be. My mom hated painting something so ugly, but she complied.